I read this 10 reasons to pass on the iPad on Tech Republic this morning http://blogs.techrepublic.com.com/10things/?p=1324&tag=nl.e101 and just had to write the 10 things that refute the argument of why to pass on an iPad. On Screen size the larger size is a convenience that is better than the iPhone for viewing and not as cumbersome as a 17” notebook. As long as the device does some things better than an iPhone and some things better than a laptop around the price of a net book it is going to be a hit. 2.) The Net books don’t have usable track pads and require mice to be attached. Also lack the CPU power and battery life the new iPad offers. IF you want a 10 hour battery your net book would weigh about 3-5 lbs. For 1.5 lbs. you would only get about 2 hours out of it not 10 hours the iPad offers. 3.) Running iPhone OS there is software to allow you to remote control your Mac from the tablet. So you get the Power of a desktop in the palm of your hand through Remote Desktop. iPhone OS is OS X with a touch interface on top. They do restrict what apps can be loaded and only allow what is in the app store but that could be altered in the future and it creates an app ecosystem most developers like and was responsible for the smash hit the iPhone became despite bugs in the process. 4.) There is never enough storage. No matter how much you put in someone will always want more. 64 GB is a good starting point. A net book with more storage would have a mechanical drive or a much more expensive SSD drive. As the price of flash drops and tech improves we will get more storage. The iPhone grew from 8 GB to 32 GB in two years. Two years from now the iPad will probably ship with 256 GB of storage and my laptop will have 2 TB of storage. 5.) Again not paying attention. I don’t have HDMI on my iPhone either but the Dock Connector can output 480p to my Television, and guess what the Dock connector accessory for the iPad can output 720p to a Television via a 30 pin to component video output that will be available day one. I agree not having the camera kind of bites. I was looking forward to video conferencing with it and there is a space for a camera in the hardware but for some reason Apple didn’t include it. It could have been price or another technical issue. It will come in the future I have no doubt. (The iPad SDK includes Frameworks for Camera support in the Address book and other places, as well as Cisco wrote the Cisco Unified Personal Communicator client to use a Camera for their iPad version). 6.) I didn’t know they were going to have a USB adapter for the dock connector. That is kind of cool. Keeping it thin and light they had to leave out the USB. It still has Wi-Fi and Bluetooth. There is no reason you couldn’t access remote storage via Wi-Fi. I have 20 gigs of storage on my iDisk and I bet I will have access to that via the iPad. 7.) Flash card access is available via the dock connector and to keep it thin and light something had to give. Most users wouldn’t use the Flash card slot anyway. You can’t put one in for every format and keep the thing .5 thick. 8.) It costs Apple $259.00 for the parts to build an entry level unit. So if they sell them at cost they could make this guys target price. Acer has already announced they can’t make a competitive product at that price point and make a profit on it so they are not going to even try and compete with Apple. The pricing is really good for the device and you get what you pay for. If you want a low performing slow net book then great spend $299 and use it as a photo frame. If you want fast and do many things including a really sensitive touch screen $499 and you are in business. 9.) It was unveiled a week ago. I am sure third party manufactures will be quick to start making items for the iPad just like they did the iPhone. I have a Belkin Tune Dock in my car, a Kensington charger in the truck, third party headphones for music, cases made by InCase, and a charger/speaker system from iHome. This will happen for the iPad too once it hits the market. How many people really carry spare laptop batteries or phone batteries with them? How do you keep them charged? Currently Mophie makes a Juicepack that plugs into the iPhone and recharges the battery to double the life of your phone. I am sure there will be a Mophie iPad case to allow you to go 20 plus hours and not need to recharge. Then you can recharge your device while you sleep. The iPad CAN run Skype in fact Skype runs on the iPhone so that will be available day one. Flash isn’t available that is correct. HTML5 looks nice and You Tube is already testing it and rumor has it Hulu is heading that way too. I can already view You Tube and UStream on my iPhone without flash. Flash is a processor and battery hog that slows my laptop down when it runs and spins up the fans. Why would I want it on my smart phone or iPad? It is time for the world to move to HTML5 and the iPhone and now the iPad will push that trend along. 10.) Wi-Fi is almost everywhere now so getting access shouldn’t be that tough if you use the Wi-Fi only model. 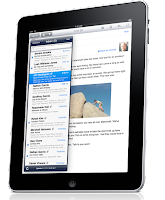 The iPad 3G is unlocked which means ANY GSM providers microGSM card should work in the device. AT&T was just the first one announced, I am sure T-Mobile and others will be along soon. Besides you can also just carry a MiFi device and connect through the Wi-Fi to any carrier you choose and your laptop can get on as well. Sooner or later tethering will come to the iPhone as well and they will likely add a way for Wi-Fi iPad users to communicate with the Internet via the iPhone in their pocket via Bluetooth or Wi-Fi. Now the 10 reasons I would own an iPad. 2.) Color Ebook Reader. My Kindle isn’t color but still currently costs about $489.00 for a 9.7” DX model. 3.) Watch movies while traveling and even be able to rent them from the iTunes store while traveling and download to the device. Sony 9” portable DVD player is about $169.00 rentals of course if you can find a place to rent a movie while traveling. 5.) Read the Newspaper while on the go. Ok this one is only .50 - $1.50 depending on the newspaper but it doesn’t update and isn’t good for the environment. 7.) Take notes in meetings. Could use a computer or a notebook but it is much easier to find electronic notes later. 8.) Share You Tube Videos with friends on a larger screen. Plus I don’t have stop my video to take a call. 10.) Remote access my Mac and PC’s for work. It would be nice to be sipping a latte in Starbucks and get a call on my iPhone that someone needs me to fix something real quick for them and I just close my book on my iPad and open up a remote desktop and using the virtual keyboard and touch screen fix the problem and then go back to my book right where I left off. There are obviously other devices that can do what the iPad does, not as attractive and not as user friendly. To buy all the devices to do what it does would cost about $1,535.27 or about the cost of a 15” Macbook Pro. So it is quite a value for what the device is capable of. The iPhone grew in its first two years of life and added features and functions as I am sure the iPad will as well. I think this is going to revolutionize how and where people work. I would like to see a camera for video conferencing. I was really hoping to see that on this version so that video conferencing could really go mainstream. I would like to have multi-tasking or something like freezing an app in a state when it gets back grounded so I can pick up right where I left off when I return to it and use Push Notifications to tell me if an app got an update. But above all I want the device to be fast, stable, and have a good battery life. The iPad can do multiple things - your 1-10 list, but each of those devices only do a single function? Not really a valid comparison. Using the same logic, my ebook runs for weeks, not hours on a charge, so I'd need 14 iPads charged to equate to the same functionality. Add on 3g service, free on the ebook... Hmmmm... iPad is looking like thousands for just a 2 week reading cycle if you don't want to carry a charger. A netbook can handle most of the things you attribute to only being done on an iPad... Picture frame, docs on the go, etc.. And I can use the Netbooks USB to charge other devices without another charger. 4. Steve Jobs needs my money. 3. I just need another piece of electronics. 2. I just don't have enough debt, so I might as well buy something expensive. I am so tired of haters. To me, one shouldn't dog it until they mess with it. I bought it *hoping* it would meet a couple needs that are currently not met. I already own an iPhone, netbook, i7 XPS Studio notebook, and a custom chilled water workstation, and I didn't expect to replace any of them. I was beyond impressed with how much more it will do than i expected, and how well. Unless you have played with it you cannot comment one whether it sux or not. iPhones had way more haters when they were released, and now you walk into a starbucks and 3 out of 4 people have an iPhone. Will the iPad replace my desktop - hell no. Will it replace my notebook, no, but for some uses I will no longer need it (like checking email or surfing web abroad). Will it replace my iPhone - of course not, but it sooo much better at looking crap up in a meeting or in the field. Does it replace a netbook for 90% of what people buy a netbook for (including myself)? Absolutely. I had planned on buying my wife a new Macbook, and i don't see a reason why I shouldn't give her this, and get me a 3g. It does everything she does with a computer. BTW - 2 points. 1) I am forever THANKFUL it doesn't have a camera. Every damn thing I have lately seems to have a camera which means I can't bring them into secure meetings, secure environments, etc. Many plants and companies have strict rules about that kind of thing now. THANK YOU Apple for leaving it off. 2) The one thing that really needs to get addressed sooner than later if Apple wants to continue saying it replaces netbooks for surfing the web - FLASH support. No excuses Apple, just support it already. Maybe Adobe will release an app for that. I'd pay 99c. BTW, there are so many already very polished awesome apps for the iPad I was shocked. Dragons naturally speaking for iPad is the bomb and so is ABC's player, Netflix, NPR,BBC and the Weather Channel. And if you want o cough up some dough the Need for Speed Shift in multiplayer blows everyone aways I have shown it to. Considering I usually shell out $60 for a game, $15 seemed a pretty good deal. All you haters, you are either going to eat your words, or end up being a very small minority in the near future. The iPad (and I was never a fanboy, just an early adopter) blew me away.